Remember when I did Speed Tasting at FIGat7th? FIGat7th has a new event for summer: FUSICOLOGY Fridays every third Friday in May and June! If you are local I highly recommend heading downtown to check out FIGat7th. 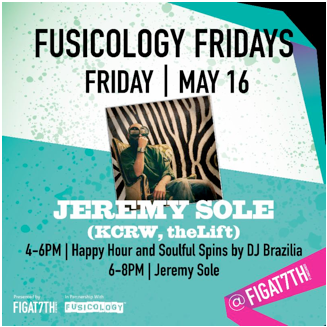 This Friday, May 16th from 4pm - 8pm check out music from Jeremy Sole of KCRW. 4-6pm is happy hour and soulful spins by DJ Brazilia and then Jeremy Sole will be on from 6-8pm. Happy hour food and drink specials are available at City Tavern, Loteria Grill, and The Melt. Mention "Jeremy" at Pazzo Gelato and get $1 off your scoops. Several stores are now open at FIGat7th: H&M (their biggest store in southern California), Victoria's Secret, Victoria's Secret Pink, Bath & Body Works, and L'Occitane en Provence!